As the third assignment to our year three Animations class we were charged with creating a rubric that would detail our learning outline for the semester. The goal was for students to choose their own skill sets that they wished to expand upon and set their own goals and projects to develop those skills, whilst also posting educational blog posts selected from the professor. I chose to create a library bank of referance and inspirational material while simultaneously performing practical experimentation in the process. I wished to make my blog as user friendly as possible and chose to talk in a casual explanatory manner. My blog plan shifted during the process and I found myself leaving detailed records of my projects online for any who wished to know more about my work. I've found that not only are my projects praised by classmates, but the question of how often comes up when one of the projects is experienced/viewed. I believe that leaving footprints behind is an important part of project work that is often ignored after the fact, but would be helpful when people inevitably ask "how". Not only that, but I'm often cast in the role of leader so most creative decisions are made by me, and I play a large role in the other members work. Deliverables: A minimum of 15 (8 personal research, 4 required readings, 1 event, 1 work screened, 1 practicioner) posts in addition to the required posts I assign are due throughout term. Required posts include assignment related posts. Grade breakdown: 30% of final grade. As part of your ongoing development as producers of animated work, you will keep and regularly contribute to a journal to document your individual process. This journal will be hosted online in a blog format that affords the opportunity for you to track your learning and to share with others your on-going multimedia sources, inspirations and resources. This idea of updating and processing your ideas is a way of tracking your own activity while expanding your exposure to animation and it’s many permutations. As multimedia practicioners, it is critical to learn how to situate your own work and acknowledge your influences within the traditions in which you practice. In addition, this will be a forum for hosting your course work with updates of project development and your own professional development throughout the term. Photos, sketches, storyboards, colour and lighting studies, diagrams, audio, video are some of the material that can be readily formatted and uploaded and linked to your blog. I encourage you also, to use this forum for creative and technical information sharing. animation. Ideally, each post should be a thoughtful and a well-articulated exploration or analysis of an idea, article or animated or time-based work that adds to your own understanding of this medium. The posts should be approximately one–three paragraphs long and where appropriate include links, visuals and other media to add value. 16 posts in addition to the required posts related to Project 1 and 2 deliverables is the minimum goal and these posts should be spread out and should be representative of your research interests and progress throughout the semester. 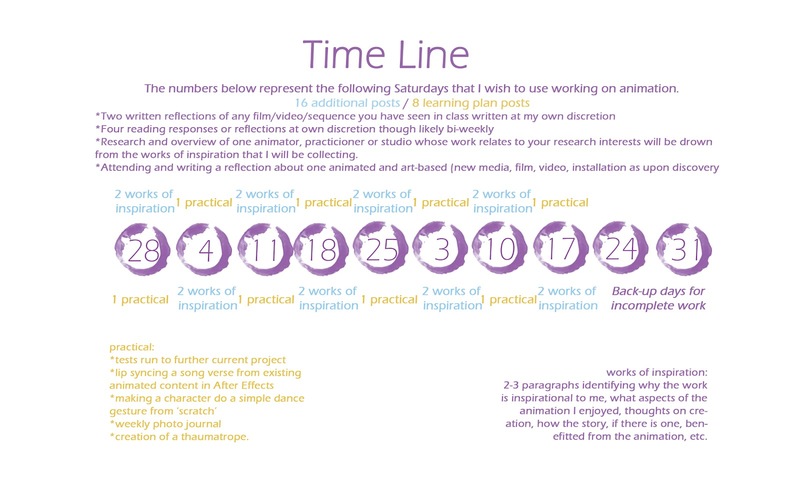 The posts should reflect a healthy mix of your technical, practical, visual, primary and secondary academic research interests as related to animation. •Attending and writing a reflection about one animated and art-based (new media, film, video, installation etc…) on-or-off campus screening. This screening CANNOT a commercial screening at a movie theatre. This is a descriptive and itemized list outlining your individual learning objectives. 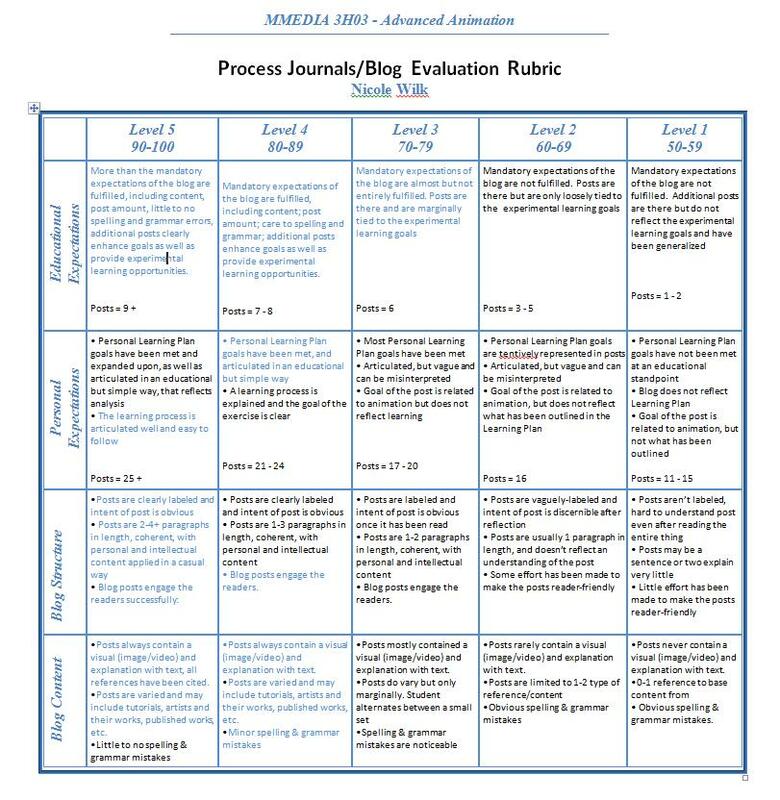 This list must include examples of technical, practical, visual and primary and secondary academic research objectives with timelines associated with each step. 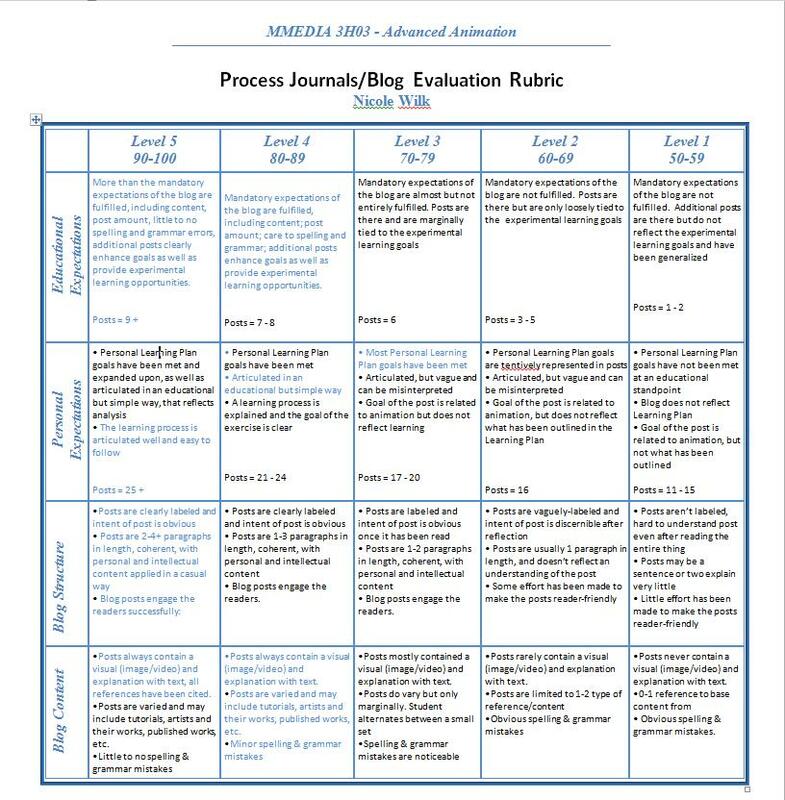 You must also create an assessment rubric (detailed outline of how you would like to be assessed for this section) and describe your objectives or what a successful outcome looks like to you. See description above, and suggestions/criteria on page two. You must design a usable evaluation system, with objective targets so that you (and I) are able to offer a fair evaluation. This is a mandatory rubric section. Jan 17, Feb 7, Feb 28, April 9; meeting assignment criteria. Regular or systematic distribution throughout term. Using the assignment criteria as a guide, please define a system Ti for evaluating what “regular or systematic distribution” means in terms of your personal learning objectives as you have described them. You must design a usable evaluation system, with objective targets and clear descriptions so that you (and I) are able to offer a fair evaluation. Please define “quality of posts” in terms of your personal learning objectives as you have described them. For example, you could assess “quality of posts” in terms of: written expression, visual expression, functionality, content. You must design a usable evaluation system, with objective targets and clear descriptions so that you (and I) are able to offer a fair evaluation. The extent to which you achieved your personal learning objectives within the timelines you indicated in your personal learning plan. Please define/outline a system that will allow you to assess the degree to which you achieved your objectives within the target dates you determined. You must design a usable evaluation system, with objective targets and clear descriptions so that you (and I) are able to offer a fair evaluation. One–three paragraphs of informed analysis (not an opinion) vis-à-vis course outcomes, language and your own learning plan objectives. Your response can be written in point form, or composed into paragraphs. One reflection is due per chapter/reading. 2. Three direct applications to the current course project, course content (ie. a screening, guest, workshop), and/or your own technical, practical, visual and primary and secondary academic research interests as related to animation and/or your learning plan objectives. 3. Any questions, clarifications on readings. I believe art is experimental in and of itself within both the realm of fantasy (abstract) and reality (accurate renditions of life), thus presenting endless possibilities for creation, experimentations, and chances for learning in both the ever expanding and upgrading program software available, such as Adobe After Effects, but also in the materials now more accessible than ever, as well as cheaper equipment. With endless ways to create available I believe the medium being the message is an important concept. The way in which the thought is expressed is important, so my goal for 3H03, and my personal learning plan is to experiment in mediums. I wish to consume the creations of others. By that I mean to expand the pool of inspiration I’ve been exposed to and build an effective library of works I find fascinatingly creative. I believe this to be a valuable way to improve my own animation abilities as I benefit from ‘starting points’, that is, by narrowing the endless possibilities of creation to a few I’ve found effective I can adopt others techniques and be more creative than if left staring at a blank page (as exemplified by adopting Caroline Leaf’s sand art during The Lost Kiss 2B03 Final project with beads on a scanner). A large part of my posts will therefore be evaluating and exploring animation techniques as they have been exposed to and altered by the medium, and After Effects tutorials. The other half of my learning plan is to do practical experimentation separate from the inspirational library. Recreating work, though beneficial, is not my goal for the library. It’s intended as a bank I can draw from, apply and adapt to projects through my own renditions; as such I wish my practical experimentations to reflect the ability to perform basic animation in various mediums. As tutorials in 3H03 accomplish basic animation tasks already, the ones I set for myself will be more selfish in nature and will include lip syncing a song verse from existing content in After Effects, making a character do a simple dance gesture from ‘scratch’, weekly photo journals, and the creation of a thaumatrope. I feel that I've gone above and beyond the expected post content. My posts are detailed, they always include visuals (commonly many) with various examples. Links are always relevant, and all sources are accounted for and cited on the page. Explanations are at minimal 2 paragraphs on every post and I've often gone out of my way to make the posts as user-friendly as possible. Some posts include sections and categories. Although my posts are detailed, with step-to-step explanations on some parts and explanatory paragraphs on others, I did not meet the outlined project quota that I had set out for myself. When it became apparent that I would not be needing the lip-syncing skill for the Tatterhood project, I cut the exercise from my outline and posted the tutorial as well as inspirational videos to my blog instead. Likewise, I did not do the character dance as I was drawing the Tatterhood animation instead. The Thaumatropes turned out absolutely lovely and have been well received by any who actually get to spin them. As I wanted the blog to be as user-friendly as possible I tried to make the blog clear and casual. Posts are colour coded depending on the category, and the post categories are the first thing you see on the bar to the right of the page. I followed my own type of formatting which included text type, size, colour and position and tried to keep the format as uniform and universal as possible. It's hard for me to judge my own spelling and grammar but I have read and re-read my posts, and any obvious failures should have been dealt with - though I am not perfect. Content-wise I believe I have exceeded, on the most part, above the expectation on post length as well as visual content. All content is properly cited, and not in ridiculous ways. Wherever possible I have linked my posts to other posts, as well as direct users to other sites. Many images had been saved first and then uploaded and cited to their source in case the source-site fails.